Nicola Pizzeria is Lambertville's oldest family owned Italian restaurant and one of the very few that offers delivery seven days a week. 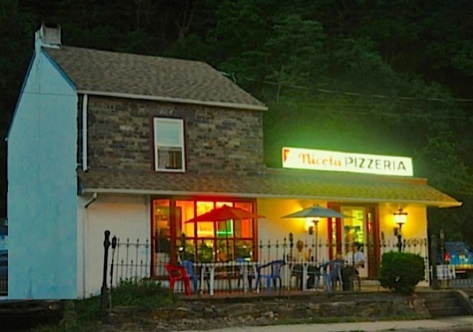 Opened in 1968 this great pizza joint has pleased generations of Lambertville and New Hope families with affordable and delicious pizza, fresh salads, sandwiches and pasta dishes. It's not easy to stay in business for seven decades but offering friendly service and good food at low prices is a great way to do it. Take the family out for an evening along the Delaware River and stop in for a delicious dinner at any of Lambertville or New Hope's great family restaurants. Check out these perfect dining options to visit after a little league game, dance class, or on your way home from soccer practice. Afterwards you can tour the town and stop in for ice cream at Buck's Ice Cream & Espresso Bar or cruise up to Dilly's in Center Bridge. We highly recommend their milkshakes.